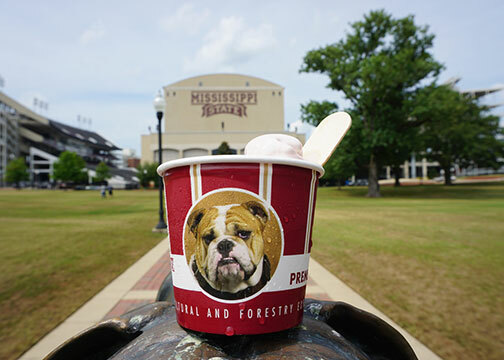 July is National Ice Cream Month, and to celebrate, the MAFES Sales Store at Mississippi State is giving away free single-scoop ice cream cones on Friday, July 14. MSU is renowned for its Edam cheese; however, ice cream is one of the many other farm-to-table products processed on campus at the Mississippi Agricultural and Forestry Experiment Station's Custer Dairy Processing Plant. The creamy frozen treat is available for purchase in six-ounce cups, half-gallon and three-gallon containers, depending on the flavor. The production of MSU cheese, ice cream, milk and butter begins at the Mississippi Agricultural and Forestry Experiment Station’s Bearden Dairy Research Center. The award-winning dairy herd, consistently ranked as a top 10 herd nationally by the American Jersey Cattle Association, produces about 475,000 gallons of raw milk each year. The 172-head herd includes Jersey, Holstein and mixed dairy cattle. Cows are milked twice a day, 365 days a year. Milk is then transported each day to the MAFES Custer Dairy Processing Plant, where cheese, milk, butter and ice cream are produced. "We produce about 25,000 gallons of ice cream each year," said Plant Manager Eric Goan. "We offer seven flavors in the six-ounce cup and 11 flavors in half-gallon and three-gallon sizes." The most popular flavor, muscadine ripple, is produced with muscadine grapes grown and harvested at the MAFES South Mississippi Branch Experiment Station in Poplarville. "It takes 150 gallons of muscadine juice to produce a year's worth of muscadine ripple ice cream," Goan said. Ice cream day at the MAFES Sales store begins at 9 a.m. and will conclude at 4 p.m., or while supplies last. The store is located in the glass annex at the front of the Herzer Food Science Building at 925 Stone Boulevard. All are welcome to stop by for a free cone and see the other products available for sale in the MAFES Sales Store. Patrons also may view cheese production beginning at 10 a.m. from the second floor viewing room in the Herzer Building. Dairy production is an outcome of the MAFES research program and teaching activities in the College of Agriculture and Life Sciences. Flavors available on ice cream day include vanilla, chocolate, strawberry, muscadine ripple, coffee and cookies-n-cream.